Talia Wolf is a conversion optimization expert teaching businesses to plan and execute conversion optimization programs. Talia Wolf has 7 years of conversion optimization experience doing thousands of AB tests using emotional, consumer psychology targeting and real time data to help grow businesses. Talia is also a frequent keynote speaker at marketing conferences. Follow her on twitter at @taliagw or visit her website, taliagw.com, to learn more about her conversion optimization training programs. Tim: Oh pop-ups! How they fill our hearts with conflicting feelings. We love to hate them but we also know they can get results. But can they be used in a way that feels like they’re just a part of the experience? Talia Wolf from taliagw.com believes that they can and she was able to prove that belief when she helped The Next Web increase their opt-in rate by 32%. That’s a great number for anyone but for a site with millions and millions of monthly visitors like The Next Web, that’s game changing. Now, just as a reminder, the all new ConversionCast is coming very, very soon. It’s gonna be the same data-driven case studies that you love but presented in a new format to help you further improve your conversion marketing efforts. I’m so stoked to bring it to you, so look for that in the next couple of months. Make sure you’re subscribed to ConversionCast. I’m Tim Paige, the senior conversion educator here at LeadPages and this is ConversionCast. All right, so we’re gonna dive right in but thanks for coming back on. I’m really excited that you came back with a new case study to share. Talia: Yeah, I’m excited to be on and share everything that I can. Tim: Cool. So why don’t we start with sharing the results that you were able to get with this particular case study? Talia: Sure. So, I mean, the bottom line at the end is at the third or fourth variation we got to 32% increase in subscriptions for The Next Web on desktop. But actually on mobile, we were actually able to get so much more and different kind of variations. We had one variation that got 35, one variation we got 70 and it really kinda changed according to the different personalization that we did. Tim: Yeah, that’s amazing! That’s awesome. All right, so just in case anybody didn’t hear us the first time. Can you tell everybody kinda who you are and what you do? Talia: Sure! So, I’m Talia Wolf and I do conversion optimization basically. I’ve been doing it for the past 7 years. I run a conversion optimization agency for 5 years and I’ve been basically running my own consultancy and doing different workshops and courses on conversion optimization. And my main focus is consume a psychology and emotional targeting. So I focus a lot on basically running really in depth and meaningful A/B tests for my clients and helping them scale their business. Tim: Nice. All right, so I’m just gonna give you a carte blanche, just go and let us know what did you do, how are you able to get these results? Talia: Well, I think the main thing is just really devising a strategy and a plan. We actually did this all with pop-ups and I chose to discuss this specific topic because anyone loves to hate pop-ups, right? Talia: [Laughs] It’s just the thing! Especially because you know, most pop-ups are done really wrong and they’re annoying and frustrating and they ruin the experience. 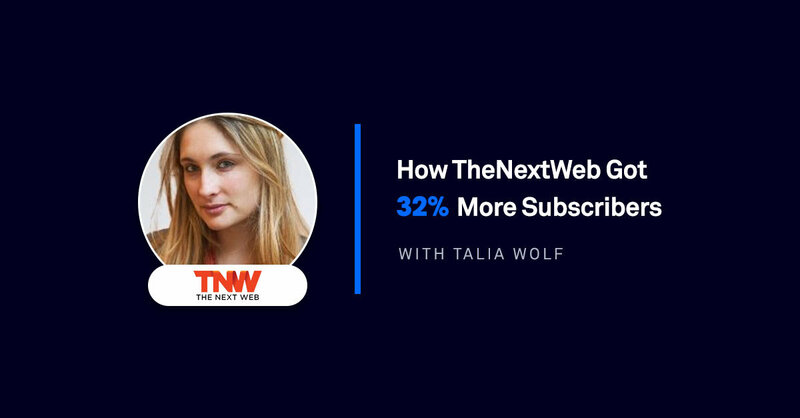 Talia: And when we went into you know — when we started working with The Next Web, they had their own pop-up, an exit in temp 1 that just said you know, subscribed on newsletter and get all the data that you want and all the information. They have a ton of traffic, I’m talking about millions and millions of people that go there every month to read their information and they really did want to increase their subscription and some people relevant content to what they were looking at. And we actually divided it into two different tests. We did a test for desktop and a test for mobile simply because the behavior and state of mind of someone on mobile is completely different than someone on desktop and that’s a general rule that I do with everything. When I optimize, I’m constantly looking at desktop and mobile differently because people on mobile are on the go, they’re kinda of multitasking, they’re doing different things than the one on the desktop in front of a computer. So the first thing that we did is the desktop part and that’s when we really kind of dug into our research and started realizing who is the customer behind the screen. So we don’t look anymore just at data which is you know, behavioral elements such as geographical location and age and device but we’re also looking at the actual emotional value the people can get from that. My main goal is always to just understand the challenge that people are facing and then try and give that in context value with everything in all my messaging and designs. So we identified who these people were and essentially, these are people who are marketers or people from the startup scene who just really wanted to stay and then know. And they really wanted to get this information up front and know things so that they can tell the world that they know stuff. So they can share stuff on their Twitter account and basically just be a lot more knowledgeable than the average Joe. And essentially, what we did is we designed three different pop-ups on mobile — oh sorry, on desktop. We used simple kind of don’t miss the hottest tech in use, don’t miss out kinda of playing on FOMO there. But one of the things that we also did is start using photos of actual people within the office. So the actual newsletter is curated by then the editor-in-chief, Martin. He is not there anymore but he used to be the editor-in-chief. So we actually added an image of him and we added his name to really give authenticity and really make people feel related to someone who they’re gonna get you know, who they’re actually gonna get that information from. And as I said, one of the other things that we did is kind of think about the when. So I’d like to say about pop-ups that it’s not just what you say, it’s also when you say it. And you know, one of the most frustrating things that happens to is you arrive on a website and it immediately gives you this insane pop-up in your face. You haven’t even read the content, you don’t even know who this person is or you know, what the website is and they’re already asking you to subscribe. So one of the things that we did is we actually only show the pop-up when people scroll it about 900 pixels, I’d say that’s about three scrolls of the mouse. And the idea was basically that we knew that when people scroll, that means that they are more engaged. They’re more interested in the content and that’s when we would actually offer the content to them and actually offer them to subscribe.And that’s how we were able to increase their conversion rates on desktop by 32%. And it was really interesting to see because we did try different variations. We’re talking about millions of people coming through this and basically enlisting to these lists. And basically being able to segment people according to the content that they are interested in. So if someone lands on an article about landing pages, if someone landed on article about AdWords, they would get the relevant content about that and they would sign up to the relevant newsletter. And that was one of the most important features of just kind of optimizing that opt-in form which is a pop-up. And that was desktop basically. And then we did mobile which was really so much fun. I’ve been using Banana Splash which is a personalization platform on mobile. It basically identifies behavior in real time so it knows what page you visited, what keywords you were using. You know how long you’ve been on the site, how much you’ve scrolled, how many pages you’ve seen and then shows you the right pop-up. And the idea is that it’s not a pop-up that completely takes over your screen because it’s mobile. It look more native so it looks more like a notification. Talia: Yeah, and it’s really cool because you can kind of personalize it and change it according to the device. So I can show a certain look and feel to an IOS device and a different look and feel to an Android device because we’re used to different you know, designs there. And that’s what we did basically. We segmented it according to device. We segmented it to appear only to returning customers so people that have already read and been to the site a couple times. So they’re not just bombarded the first time they come to the website. And we made sure that these are people that scrolled enough so free from scrolls, free from scrolls — that’s so hard to say. Talia: [Laughs] And also worked on the creative itself. So gave people an IOS look and feel, on an Android gave them a different look and feel. Put a lot of emphasis on the fact that it’s you know, being edited by someone personal that they know and they saw a 34% increase in use of the signups on mobile. And it’s actually quite interesting because at some point, mobile was actually converting more than desktop.So we’re getting on lead on subscriptions and signups over that because people were getting more relevant content. We also did a few other things with them basically just sending people to relevant courses online. So the next level also offers these really cool UX and UI design courses and development courses and basically kinda how to code and stuff. Talia: Yeah, and it’s just — what was really interesting here I think is the combination of the strategy. So basically thinking about the customer presenting their value, thinking about their emotional trip is what is interesting to them. And then knowing when to actually show it and not being, you know, bombarded with pop-ups everywhere in your screen and being annoyed by it. And it’s a strategy that has been working for The Next Web for over 2 years now because that’s basically how long we’ve been working with them. And it’s amazing to see how we can constantly optimize the pop-ups. So we can constantly optimize different designs and other things that were doing for them but seeing these kind of changes. Just being able to identify those emotional triggers and understanding what our customers are looking for. We were able to personalize it and obviously double and triple their conversion rates. Instead of doing something like just testing a color of the call to action button or just changing a title of the page or a pop-up. Tim: Right, it’s been this journey over the past few years of folks starting to understand that just because you are marketing to many that you can’t communicate one to many. That it’s gotta be a one-to-one experience. It’s gotta be what is that person doing, thinking, feeling at that exact moment and when you communicate you have to be talking just to them and not, you know, doing this thing that’s this broad catch all. And that’s where you know, I love the different focus on your mobile device. I love the idea of kinda making it look like it’s native to that device. It’s awesome and I love how personalized this is. So I don’t think there is much more to say. So Talia, thanks for coming back on the show. Talia: Thank you for having me.